Happy Valentines Day! What are you doing to celebrate this year? I hope it's something wonderful. I love the idea of a holiday celebrating love. Plus, it's the only day of the year where excessive consumption of chocolate and wine is deemed perfectly acceptable for everyone. And speaking of chocolate and wine...our two favorite Valentines Day indulgences revert back to their natural roots in this Chocolate Walnut Espresso Loaf, utilizing cocoa powder and grapeseed oil for a health(ier) chocolate treat that's just as rich and decadent as the name suggests. (Obviously, to fit the occasion!) The cocoa and expresso powder are bitter and raw, but thickened by the creamy yogurt. Sugar is not overpowering here, a seriously welcomed relief if you've spent the day stuffing your face on drugstore candy (guilty as charged.) Best of all, since the chocolate loaf is lightened in fat but packs a caffeine punch, it makes a great breakfast option in addition to an afternoon pick-me-up or post-dinner sweet treat. The outside crumb is firm and crunchy, thanks to a generous smattering of toasted walnuts, giving way to an impossibly dense, moist center. The bitterness is almost startling—begging to slice off another piece to make sure—but as I mentioned before, the absence of saccharine overmuch pleasant and comforting. It's kind of like a sophisticated mocha brownie bread. Oh Chocolate Walnut Espresso Loaf...will you be my valentine? I've already delved into cocoa powder's fruitful flavanoids in my other chocolate recipes, but grapeseed oil is new to both this blog, and to me. When grapes are pressed to make wine, the grape seeds become separated from the grapes. Upon grinding, the seeds release an oil that contain fatty compounds, proteins, vitamin E and our friends the flavonoids. One kind, OCPs (oligomeric proanthocyanidin complexes, say that 5 times fast) is an especially health-touting antioxidant. Grapeseed oil is often found in recipes that require a high cooking temperature thanks to its high "smoke point", meaning it resists releasing free radicals (a known cancer risk) during cooking at extremely high heat levels. While grapeseed oil does contain both heart-healthy omega-3 and omega-6 fatty acids, don't throw out that olive and canola oil just yet. It's omega-6 content is almost double its omega-3 (the healthier of the two), plus it's high polysaturated fat content means that while it lowers LDL (bad cholesterol), it may lower good cholesterol too. 1. Grease an 8- by 4-inch loaf pan with oil and lightly dust with flour, knocking out any excess. Adjust oven rack to middle position and preheat oven to 350°F. In a small bowl, whisk together flour, cocoa powder, espresso powder, baking powder, and salt; set aside. 2. In a large bowl, whisk together eggs and sugar until smooth. Add grapeseed oil, yogurt, and vanilla extract and whisk until combined. Add dry ingredients to bowl and whisk until just combined. Stir in 1/2 cup walnuts. 3. Pour batter into prepared pan and smooth top. Sprinkle remaining walnuts over top of cake. Bake until top is dry and a cake tester inserted into the middle of the cake comes out clean, about 50 minutes. Let cool 15 minutes then turn out onto a wire rack to finish cooling. "Grape Seed." University of Maryland Medical Center. University of Maryland Medical Center, n.d. Web. 13 Feb. 2013. Marie, Joanne. "Grape Seed Oil Health Benefits." SF Gate. San Francisco Chronicle, n.d. Web. 13 Feb. 2013. Sacks, Frank, Dr. "Ask the Expert: Omega-3 Fatty Acids." The Nutrition Source. Harvard School of Public Health, n.d. Web. 13 Feb. 2013. 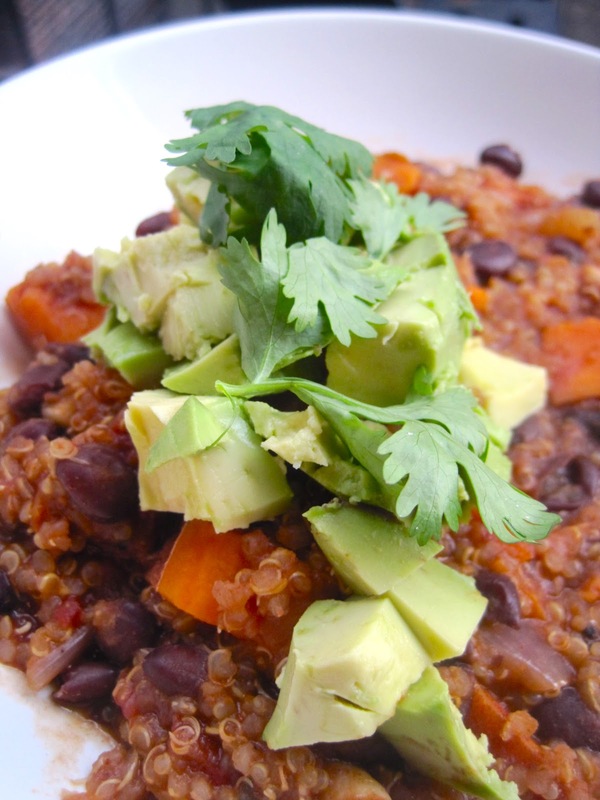 This Vegan Quinoa & Sweet Potato Chili recipe is a cooking checklist dream come true. Healthy? Yes. Cheap? You got it. Full of items most likely already stocked in your kitchen? Uh-huh. One-pot wonder? Done. Under 30-minutes? Yup. Freezer-friendly? For sure. Filling, flavorful, hearty, wholesome? Each more than the last. And last but not least (because I am running out of different ways to say the affirmative), it's absolutely delicious. I've had this recipe on my "to-try" list for a while, finally putting my mind to it last Sunday in the Superbowl spirit. A true "pantry" dish, over half the ingredients are kitchen staples; the four fresh ingredients—onion, sweet potato, cilantro, and avocado— can be purchased for under $4. A little sautéing and simmering, and 30 minutes later, voila! Introducing the meatiest, meatless chili you've ever known. It's so easy to get enveloped in the hearty delicacies of this chili—a plump stewed tomato, grainy quinoa spoonful, or tender sweet potato chunk; each exhibiting perfectly balanced hints of spicy, nutty, fiery, and herbed— that the realization it's sans meat occurs as a mere afterthought; most likely while you're scraping clean the bowl from your first (OK, second) helping. In fact, it is so inconsequential that I debated even including the word "vegan" in the title of this recipe, fearing the word would serve as an automatic turn-off to carnivorous chili-lovers. I promise, this dish is anything but a paled comparison of the beloved game version. If anything, the organic vegetables and seeds yield even more hearty, intricate flavors: starchy sweet from the potato, and a subtle nuttiness from both the quinoa and a most unexpected ingredient: cocoa powder. Yup, that slightly bitter, complex undertone adding an extra layer of depth to the multitude of spice is indeed chocolate! (Happy Valentines Day). Unsweetened cocoa powder earns the MVP ingredient award here, casting an almost mole-like nuance to the stew, and tempering the acidity of the tomatoes. With it's powerful flavors comes a host of excellent health benefits too, such as concentrated antioxidants (pure cocoa has the most) and cardiovascular benefits, including reduced blood pressure and increased coronary artery blood flow. I thoroughly enjoyed my chili bowl topped with creamy sliced avocado and chopped cilantro, but other add-ons could include chopped scallions, crushed tortilla strips, and shredded cheese or sour cream if you're dairy craving proves insatiable. (But try it without, first!) This recipe serves 4-6, but if you're cooking for less I highly recommend making the full batch and freezing the rest for a later date. A chili so hearty is bound to yield repeated appentencies. 1. In a large pot, heat oil over medium heat. Add onions, and cook until soft and translucent, stirring frequently, for about 5 minutes. 2. Add garlic, tomato paste (if using diced tomatoes and juice, add with stock) chili powder, cocoa powder, cumin, and oregano. Cook for 2 minutes. 3. Add black beans, vegetable broth, and sweet potatoes; season with salt & pepper. Raise heat to bring to a boil, and add quinoa. 4. Turn heat down to low, and continue cooking for about 20 minutes, or until quinoa is cooked through, stirring every 5 minutes. Add additional salt & pepper to taste. 5. Serve topped with avocado and chopped cilantro, or other desired garnishes. Shifko, Robert. "What Are the Benefits of Pure Cocoa?" LIVESTRONG.COM. N.p., n.d. Web. 08 Feb. 2013. One swallow does not a summer make. But one sardine does a winter make? For this humble but mighty fish, an unexpected cold-weather benefit confirms it surely does! Named after the Italian island Sardinina, sardines are definitely the herring family’s hippest and healthiest member. Famed restaurateur Gabriel Stulman’s newest West Village hotspot, Chez Sardine, literally translates to “House of Sardine.” And while ordering the minute ocean-dweller off a menu will most likely feature the fish in it’s entirety, eyes, skin and all; canned sardines (available skinless and boneless) provide an excellent alternative for easy and painless home cooking. For such a little fish, the sardine’s health benefits are disproportionately tremendous to its size. Omega-3 fatty acids support cardiovascular health by lowering triglycerides and cholesterol levels, play a significant role in cancer prevention and bone and joint strength, and even promote ocular health. Worried about Mercury and PCBs? Not a problem in this bottom-of-the-food-chain fish. No wonder fish oil softgels are all the vitamin and supplement rage right now. But in the dead of winter, when cold dry air manifests its nasty self in full force through thirsty skin and chapped lips, sardines offer an additional perk to these already lucrative health benefits: dry skin relief, packing a serious moisture punch from the inside out. Chockfull of essential fatty acids that calm inflammation and keep skin conditioned, sardines can help alleviate your winter epidermal woes— straight from the kitchen. Your own home, a chez sardine! A frequent ingredient in Mediterranean and Italian cooking, sardines offer a briny, salty burst of flavor that enriches many a dish, especially pastas. In this classic Sicilian Pasta con Sarde, the fishy protein elevates a simple “pantry” spaghetti to a whole new level of sophistication, flavor and nutrition. Sautéed in an ambrosial stew of tomato, fennel, garlic and raisins, the sardine chunks are disseminated throughout the sauce, toning down the fish’s concentrated intensity. The dish is finished with a generous smattering of toasted breadcrumbs, pine nuts and fennel fronds to deliver a delightful crunch and texture twist against the slippery noodles. Merci, chez sardine. Sincerely, your skin and taste buds. Open the sardine tin and drain a tablespoon of the oil into a large skillet, over medium heat. Add fennel (not fronds) and cook until fennel softens and begins to caramelize. Add garlic and red pepper flakes. Cook for 2 minutes. Add tomatoes in their juice and the raisins. Cook uncovered, so the liquid reduces, and then pour in vermouth or cooking wine, simmering for 5 more minutes. Add the sardines to the skillet, breaking up slightly with a spatula. Meanwhile, pulse together toasted breadcrumbs and parsley in a blender or food processor, and then add 1 tablespoon of lemon zest to the breadcrumb mixture. Set aside. Add lemon juice to the tomato mixture, and season with salt and pepper. Add pasta to boiling water and cook according to package directions. When pasta is al dente, drain and transfer to the skillet, cooking for 3 more minutes. Add a tablespoon of pasta water if sauce looks in need of liquid. 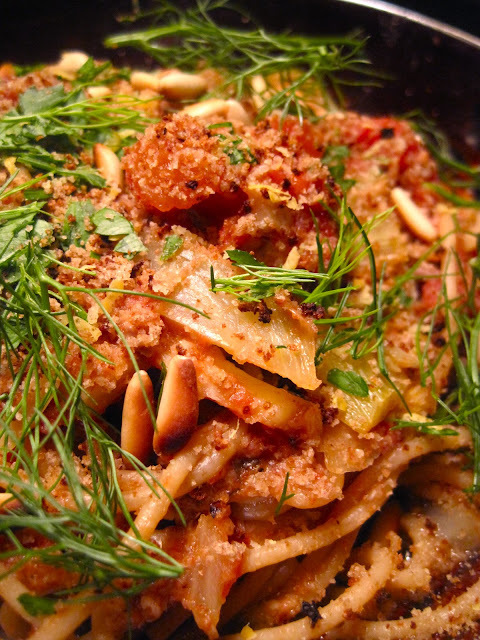 Serve pasta immediately, sprinkled generously with breadcrumb mixture, pine nuts, and fennel fronds. "6 Health Benefits of Sardines." 6 Health Benefits of Sardines. HealthDiaries, 14 July 2011. Web. 30 Jan. 2013. Weitz, Gene. "The Best Foods for Dry Skin Relief." Smart Health & Beauty. N.p., 19 July 2011. Web. 30 Jan. 2013.